The Alfa Laval OF 900 has a centre-to-centre flow path and a hermetic design. 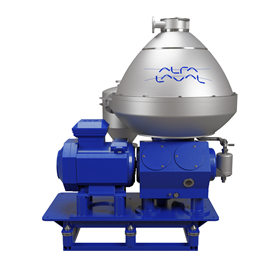 Alfa Laval has introduced its OF 900 centrifugal separator for separating solids, especially hazardous contaminants, from fluids such as condensate, oil and water. Specifically designed for the demands of the oil and gas industry, the Alfa Laval OF 900 is intended for tough separation cases where submicron particle contaminants, for example, mercury and arsenic, need to be removed. The Alfa Laval OF 900 has a centre-to-centre flow path and a hermetic design. The centre-to-centre principle ensures gradual process liquid acceleration into the high G-force separation environment of the disc stacks. The company says that this flow path design means that the Alfa Laval OF 900 uses 30% less power than conventional centrifugal separators. In terms of process integration, both the inlet and outlet of Alfa Laval OF 900 are hermetically sealed by mechanical seals which prevents gas flashing inside the separator and eliminates the need for upstream degassing vessels. The Alfa Laval OF 900 consists of a machine bottom part, a housing a gear drive and lubrication system and a top part, which features the bowl, bowl casing with cooling jacket and outlets for separated liquids and discharged sludge. An online/offline training tool for crews.